Gustavo Pacheco was born in Rio de Janeiro in 1972 and currently lives in Brasília. He earned a law degree from the Pontifícia Universidade Católica in Rio de Janeiro in 1995. In 1998, he earned a Master’s degree in International Relations from the same university, and in 2004 he earned a PhD in Social Anthropology from the National Museum / Universidade Federal do Rio de Janeiro (UFRJ). 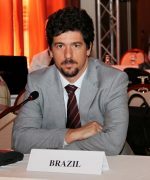 His PhD thesis, on pajelança and encantaria in Maranhão, won the 2005 Sílvio Romero Prize for Monographs in Folklore and Popular Culture from the Ministry of Culture and the National Institute of Historical and Artistic Heritage. He is co-author of the book Caixeiras do Divino Espírito Santo de São Luís do Maranhão (Associação Cultural Caburé, 2005) and co-editor of the book Memória do Jongo: as gravações históricas de Stanley J. Stein (Folha Seca, 2008). He has published in the areas of ethnomusicology, popular culture, the anthropology of religion, and Afro-Brazilian anthropology. In 2006 he entered the field of diplomacy and since 2008 has been Professor of Brazilian Culture and Thought at the Rio Branco Institute.